Expecting my husband’s death from pleural mesothelioma was like sitting on a ticking time bomb — knowing it would go off and being powerless to stop it. Every night for the two years between his diagnosis and his death, I went to bed with the thought of losing him on my mind and woke each day to the same sad reality. We had been together for 34 years when he was diagnosed. The thought of losing him broke my heart. At times, my stress rose to such a level that I felt like running into the street and screaming my head off. Not wishing to upset the neighbors, I did not give in to this urge. I did, however, manage to find a place where I could put a voice to my emotions. 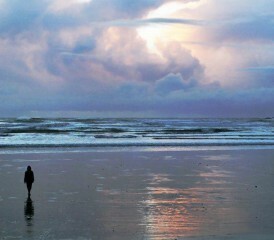 We lived on the coast at the time, and I began taking regular walks along a secluded beach. Here, with only the seagulls to hear me, I yelled and screamed to my heart’s content without reservation. Letting go of my self-control was incredibly liberating, and I could almost feel the anxiety and stress flowing from my body. I found that swimming also helped manage my stress. Once submerged in the ocean, I could think of nothing but the feel of the cold, salty water against my skin and how good it made me feel. Although I did not realize it at the time, swimming in the ocean was good for me in many ways. Rid your skin of foreign toxins and heal your cuts and sores. Cleanse and revitalize your skin. Relieve your muscular aches and pains. Exfoliate your scalp, and get rid of dandruff. Maintains healthy teeth and bones. Iodine is a primary trace element and one of the most powerful natural antioxidants. It is also a natural antibiotic that helps protect us against infection. The sea is rich in iodine, which is why swimming in the ocean is so good for us. Iodine is also present in the atmosphere, especially when we are near the seaside. Maintains optimal energy levels in the body. In addition to the therapeutic properties of the ocean, it also provided a safe way for me to exercise. I had given up sports some years ago because of bad knees and was prone to putting on weight. Because swimming is a non-weight-bearing exercise, it let me be more active, and I was able to burn a lot of calories. This is not to say that I swam marathons. A lot of the time, I just floated. I discovered that floating was good for me, as well. The near-weightlessness of floating relieves the stress on our muscles and relaxes them. More oxygen-rich blood is diverted from your lower limbs to other parts of the body, including the brain. The result: increased alertness. In addition to those health benefits, my regular trips to the seaside got me out of the house and exposed me to fresh air and sunlight, a natural source of vitamin D, which is essential to health and well-being. Unfortunately, it was not possible for me to visit the beach every time I felt overwhelmed. It became necessary for me to find another way to unwind. Always a lover of music, I set aside a time each day (usually when Brian was taking a nap) to listen to a selection of my favorite songs or instrumental pieces. I would then lie on a beanbag, with my headphones on and my eyes closed. When listening to music this way, I was able to shut everything out and focus only on the words or melody of the piece that was playing. Sometimes, I put meditation music on and drifted off to sleep. No matter what type of music I listened to, it never failed to make me feel better. Music is far more than a combination of different sounds and vibrations. It is also a powerful stimulant that can have a dramatic effect on our emotions and even change our heartbeat. Lively music, for instance, quickens our heartbeat and stimulates us into action. That’s why this type of music is good for parties and places where people love to dance. Music with a slower tempo, on the other hand, has the opposite effect. It slows our heart rate and helps us unwind. It can be helpful to listen to slow music when we are feeling anxious or distressed, because its calming effect reduces physical tension and helps alleviate stress. Caregiving for a loved one with a terminal disease like mesothelioma is a devastating experience that can only be understood by those who have experienced it. Although I have talked about managing my stress, I do not attest that caregiving for a terminally ill loved one could ever be stress free. Experience has taught me that it is possible to reduce stress so that it does not become debilitating. Visiting the seaside and listening to music are good for our well-being. For me, these activities also worked to manage my stress. If you are caregiving for a loved one with mesothelioma, find something that works for you. Remember, your health is important. Without it, you may not be able to continue your caregiving role or be strong for your loved one when they need you most.